(Black Axe#1/Black Axe#2 (fb) ) - After Mys-Tech contracted the retired immortal Black Axe to invade Hydra and kill a scientist named Mendel who thought he had discovered the genetic key to halting the aging process, they sent the Sisters of Grace to discover why Black Axe had failed in his mission. Black Axe responded with an energy blast from his axe, which Esta easily blocked. Tella ordered the others to fall back and then ordered Jessie to "capture the queen." Jessie leapt into action and grabbed Emily Hall, who had been aiding in Black Axe's recovery. Ness grabbed Black Axe and the leader asked if Black Axe would now listen to them. An explained that the Mys-Tech board only wished to be reassured that Black Axe had not abadoned his contract and that they hoped that their faith in him was justified. She then explained that the Sisters of Grace were commissioned to impress upon Black Axe the urgency of his assignment and then asked him if he was impressed. 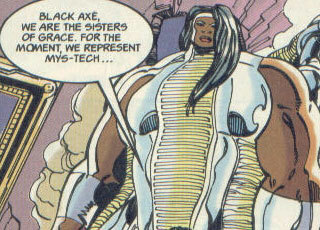 (Black Axe#3 (fb) - BTS) - The Sisters of Grace filed a report on Black Axe's powers and gave it to their Mys-Tech employers. Comments: Created by Simon Jowett, Edmund Perryman, and Rod Ramos. Jessie was the only Sister of Grace actually named in the story. "The Sisters of Grace were the result of a last-minute rewrite of the last couple of pages of Black Axe#1. Originally a confrontation between BA and Marvel UK's lead team of Warheads, I was told to remove the Warheads (no idea why) and was left to my own devices about how to replace them. Cue the Sisters." Standing in the gaping hole in the front of the castle, back-lit by the powerful lights of their Mys-TECH bubble jet, are THE SISTERHOOD OF GRACE - five young women, biologically and, in at least one case, cybernetically enhanced by Mys-TECH. In addition to their physical peculiarities, all five of them are wearing state-of-the-art weaponry. Edmund drew one more Sister (Dorrit) than requested (the "little person", in Proto-Man's article), which is why there are six in the 12-page strip written for a proposed anthology. You'll also notice that the panel description has them as "biologically and, in at least one case, cybernetically enhanced by Mys-TECH". While developing them further, I decided to brush that under the carpet and go a completely different route. The dialogue gives an idea that they're only temporarily connected to Mys-Tech, so I figured No Foul. I intended to send them off on a galaxy-spanning quest to find their creator which, I figured, could run for as many mini series as I could convince Marvel to buy, as they chased down false leads and got side-tracked into unintentional acts of heroism. But history had other ideas. 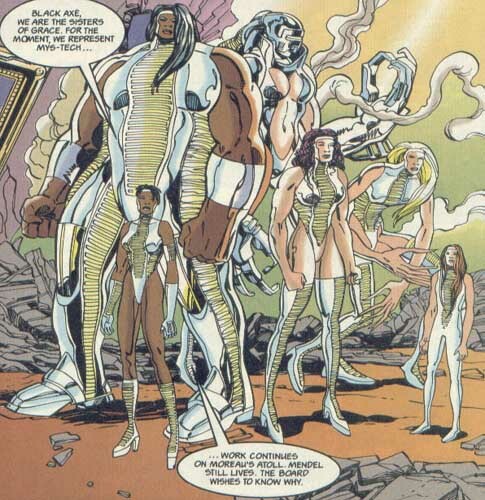 They had a miniseries announced (presumably the story Simon mentions above) by Frontier Groups Editor Michael Bennent in an interview in Comics World#17 (July 1993), which Bennent described as a "humour-based title about six hot babes in space." Simon had only written a few pages when the axe fell. Sisters of Grace was barely there at all. Intended to be a freewheeling space-opera romp, it would have featured the Sisters - a group of super-powered clone-sisters - searching the galaxy for the source of their genetic material, the aforementioned Grace, while various nefarious parties tried to stop them. Esta was the Sister of Grace who blocked Black Axe's axe attack. She appeared to have superhuman durability as she took a blast from Black Axe's axe at nearly point blank without even breaking a sweat. Jessie was the Sister of Grace who subdued Emily Hall during the Sisters' scuffle with Black Axe and also the only Sister of Grace mentioned by name. Jessie had the superhuman power to convert her hands into razor-sharp weapons. She usually kept them in the form of elongated claws, but had been seen to alter the shape of the claws. Dorrit was a small Sister of Grace who mostly remained in the background during the scuffle between the Sisters and Black Axe. She appeared at a small stature, which could be related to some sort of size-reducing ability, but then again, she could've just been a little person. Ness was the Sister of Grace who grabbed Black Axe while An explained the reasons for the Sisters being there. She appeared to be some sort of cyborg, with a vice-like hand. An was the Sister of Grace who explained their reasons for appearing before Black Axe. She did not show signs of superhuman powers. Tella was the apparent leader of the Sisters of Grace, as she spouted orders to the other Sisters. She did not show any signs of superhuman powers.